There is a moment that I love when analyzing markets using Hurst’s cyclic principles which is when all the pieces of the puzzle fit into place. It is an “Aha!” moment that removes analysis uncertainty, and suddenly we can see just a bit further into the misty future. Such a moment happened for me when I realized that the October trough was an 18-month cycle trough (as discussed in this post). After that realization it was no surprise to see the market climbing so steeply. Of course the market has been bullish: it is bouncing out of an 18-month magnitude trough. The media is full of speculation about how long this bull market is going to last, and so I thought I’d throw in my two cents worth! Of course the concept of “how long the bull is going to last” depends on your time-frame, but the bull market that everyone is discussing, and that I am writing about here is the move that started in March of 2009. There is a wonderfully complex thought process that lies behind the Hurst Cycles logic that is used to answer this seemingly simple question. Complex but not difficult, it is bit like holding the many interlocking pieces of a jigsaw puzzle in your mind. If you get lost simply go back one step, and if that doesn’t work take a coffee break and start again! We expect prices to trace out M-shaped moves at all degrees. Those M-shapes are distorted by the power of longer cycles because of the way in which multiple cycles combine, and sometimes they can be distorted so much that the full M-shape might not be clear, but there will always be an upwards move followed by a downwards move (what could be called an A-shape), even if it is very unbalanced. The position of the peak in the cycle. If the peak is early, it implies a bearish shape, if it is late then the cycle is bullish. And the relative positions of the troughs. This is more obvious: if the closing trough is higher than the trough at which the cycle starts then it is bullish, if it is lower then it is bearish! 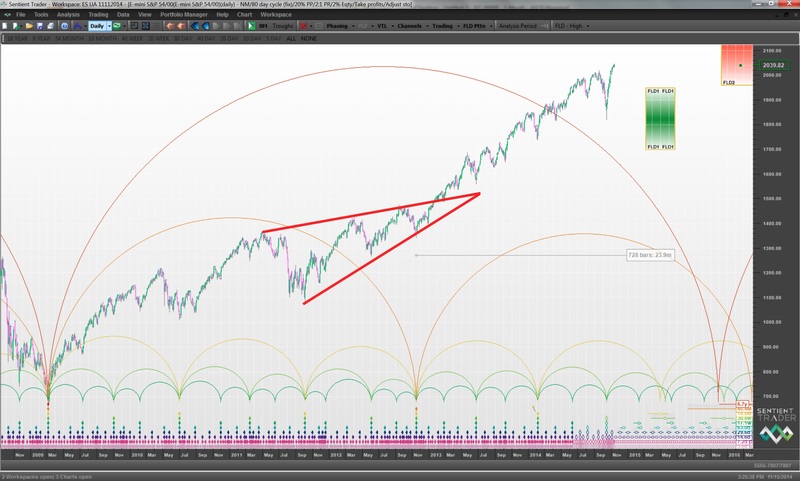 The next thing to note about the shapes that cycles make in the market is that they tend to follow a sequence. That sequence goes like this: following the trough of a longer cycle than the cycle being considered, the first cycle is expected to be bullish. Then if the harmonic ratio with the longer cycle is 2 to 1 then the second cycle is expected to be bearish. If the harmonic ratio with the longer cycle is 3 to 1 then the second cycle is expected to be neutral (or less bullish) and the third cycle is expected to be bearish. The reason I mention cycle shapes is that the answer to the question “how long is the bull market going to last?” is in the cycle shapes. The bull market we have witnessed over the past five and a half years has provided us with the framework to start considering the shape of the current 9-year cycle. This bull market will end when the peak in the 9-year cycle forms (as mentioned by John in this post). When will the top occur? We need to consider when the 9-year peak is likely to be. That peak is already “late” in that it has occurred after the mid-point of the cycle. And so the peak of the 9-year cycle will also be the peak of the current 54-month cycle, which started in November 2012 (that could be debated, but for the purposes of today’s argument let’s accept that as the 54-month cycle trough). Calling that cycle bullish is an understatement, but the important thing is to stick to the definitions given above for whether a cycle is bullish or bearish. 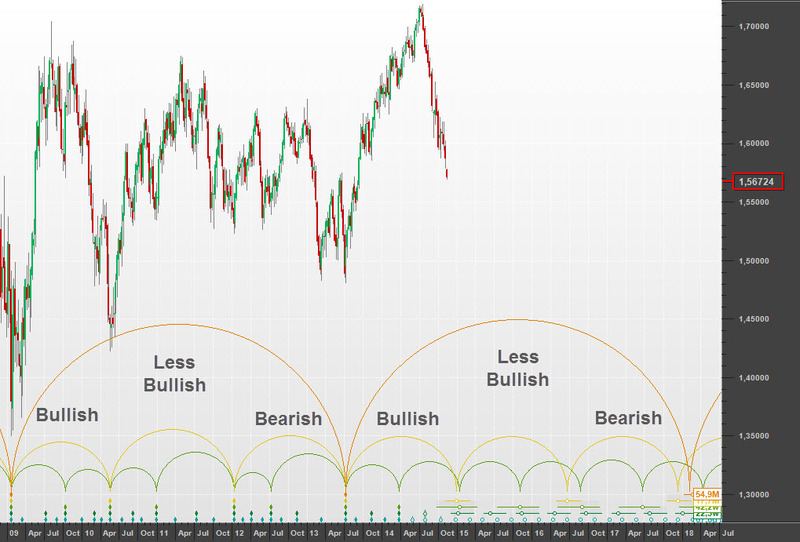 Now following a bullish cycle we expect a bearish cycle (according to the sequence of cycle shapes described above). And so we expect the current 54-month cycle to have a bearish shape. And so when do we expect the peak of the current 54-month cycle? 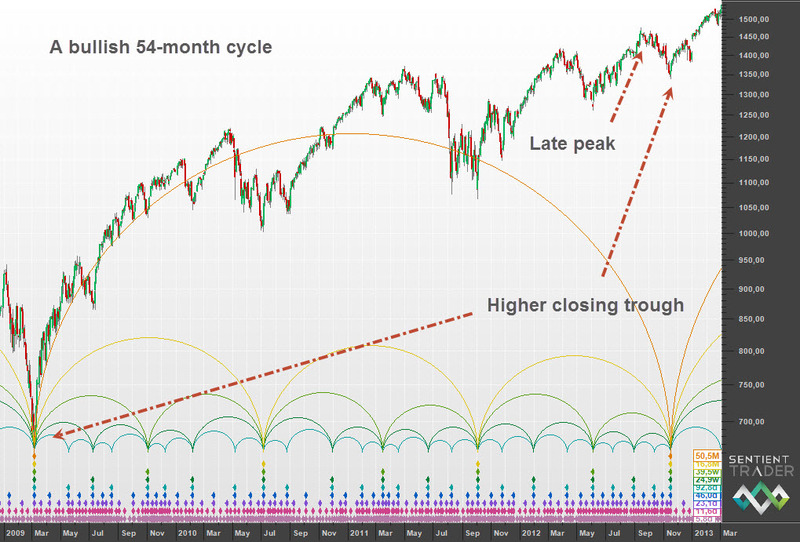 We expect it to occur early in the cycle, in either the first or the second 18-month cycle within that 54-month cycle. The new highs achieved recently rule out the possibility that the peak occurred in the first 18-month cycle, and so the peak of the 54-month cycle is expected to occur within the current 18-month cycle. Now there is an important subtlety here – you might feel that the extended upwards move since November 2012 already feels “more bullish” than the 54-month cycle between March 2009 and November 2012. But remember that we are looking at cycle shapes here, not the overall level of the market. And we have only seen the first 18-month cycle of the current 54-month cycle, which was expected to be bullish, and does not mean that the full 54-month cycle cannot end up bearish. And so our logical process tells us that the 9-year cycle peak is expected within this 18-month cycle. Can we go further than that? Yes indeed. When do we expect the peak in this 18-month cycle? The answer to that question of course lies in the cycle shape we expect. What cycle shape do we expect? Neutral, or at any rate less bullish than the previous cycle shape. And that implies that we expect the peak of the cycle to occur near the mid-point of the cycle, or that we could expect to see a balanced double-peak form here (the M-shape). Which of those is more likely? Neutral cycle shapes almost always exhibit M-shapes as opposed to A-shapes, and so the double-peak option is more likely in my opinion. Will they be equal peaks, or will one of them be higher than the other? Remember that the peak of the current 54-month cycle is expected to be early (because the cycle is expected to have a bearish shape), and so the odds favor the formation of the higher peak at the first of the two peaks that form the M-shape. And there finally is the answer to our question: we expect the bull market to continue until about March 2015 (where the first peak of the 18-month cycle is likely to form). There will be another run up which will complete in about October 2015, but it is unlikely to exceed the earlier peak. The great thing about using this approach to cycle shapes is that we can update and monitor our forecast as the cycle shapes unfold. For instance that March 2015 date might move earlier if we see any signs that the bull is weakening. Those signs will show up in the cycle shapes of the shorter cycles. The current shape of all cycles shorter than the 18-month cycle is looking bullish, as expected, but as the shorter cycles form we can detect any move towards bearishness, which will allow us to adjust our expectation for the end of the bull market. 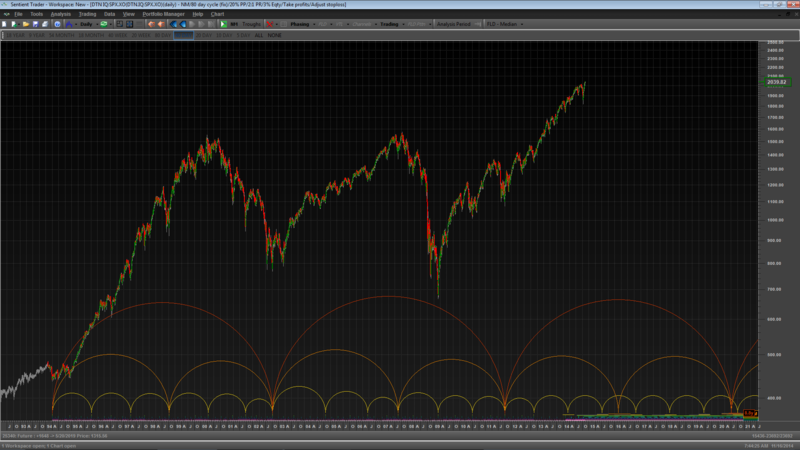 This logic is all based on the sequence of cycle shapes in the market. How reliable is that? Do you notice the anomaly? The 18-month cycle from October 2011 to November 2012 is not bearish. It is an inconsistency that has bothered me for almost three years. It is either explained by accepting that the markets aren’t perfect, or by accepting that there is the harmonic echo of a six-year cycle at play (as discussed here), or perhaps this analysis is simply wrong! Examination of the displayed results show, on a monthly chart, over the examined data set of 156 months, a dominant cycle was found with a range of 38-45 months. More recently, the dominant cycle ranged from 10-16 months, currently 15 mos. John Elthers has proposed the idea of tuning indicators to the dominant cycle, David stated that he would love to see analysis with the DSP results inputted, and I am proposing the idea of tuning the Hurst Nominal Model to what the data contains. This is very different than taking the Hurst Nominal Model and fitting the data into it. I have set the Nominal Hurst 54 month cycle to 40 months and by assuming the Principle of Harmonicity, I can reverse engineer the 9 year cycle down to 6.63 years…….the 6 year harmonic echo that David talks about and even though it is not shown on this chart, the 13.25 year(18 year), which bottomed in 2009 has still not topped out. This approach has allowed the detected market cycles which have been determined objectively to guide the analysis. Thanks Stuart. Very interesting to see how the analyses compare with different nominal models. It demonstrates well the point that Hurst made about how different analysts eventually end up reaching similar conclusions. Yes, the periodogram is one of the Ehlers collection, which you find it in the indicators libraries at various places. It make sense to me to cut the elephant in two pieces as David proposes, before and after the through, as both sides are different. 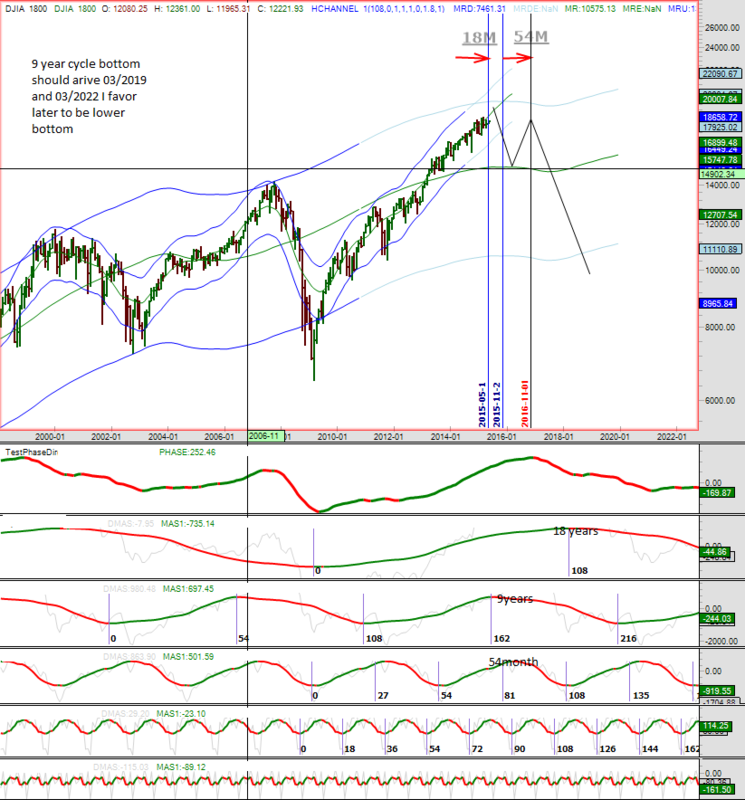 Chances are that the 54mo through is a mid channel pause of a dominant 18 mo cycle starting early 2009. If the last 18 mo of the three cannot be bullish (based on the “M” shapes), would this then not put a limit on how strong or weak the underlying trend can possibly be? Here I would rephrase David’s question, not in terms of M-shapes of a putative dominant cycle, but rather as: is it possible to recognise a mid channel pause, and if so, is it then always that the cycle before the MCP has to be bearish (that is, not only for the 18 mo cycle) or is this different for a strong trend? I can see a triangle motif in the data, albeit that both sides are upgoing. Thanks Huub. The long-term mid-channel pause explanation would certainly clear up the apparent anomaly. I’ve been working with an alternate Sentient Trader analysis, which utilizes an SPX or DJI analysis period that starts anywhere between Jan 1994 and March 2000. That analysis continues to place a 4.5-year cycle trough at the 2002 low. That 2002 low was important in my opinion because it marked the end of the first multi-year bear market in US stocks since the 1966-1982 period. That analysis then goes on to place the next 4.5-year cycle trough just prior to the 2007 top, and then places the next 4.5-year cycle trough in October 2011, which is still the low in US stocks when priced in gold since Y2K. Notice that this analysis does not place a 4.5-year cycle trough at the March 2009 low. My working theory is that the stock market, had it not been for the massive central bank intervention starting in late 2008, was destined to continue lower into its next natural 4.5-year cycle trough in October 2011, and would have done so had the underlying unit of measure not been systematically shrunk by the Fed’s POMO schedule. So did the unprecedentedly huge money printing campaign merely just give the appearance that the bottom was “in” on stocks in 2009? If so, are the original cycles still running unhampered, or has the Fed’s actions actually altered (shifted, sped-up, or delayed) the natural unfolding of the cycles? Food for thought . .
Once last note: In the Sentient Trader analysis starting anywhere form 1994-2000, it places a 4.5-yr cycle trough at August 2007 dip, less than two months before the 2007 top. Could we be seeing a replay of that very same thing now, with ST placing an 18-month cycle trough marker in mid-October? The previous post included a screenshot of the organic Sentient Trader analysis of the SPX starting at the Y2K top. 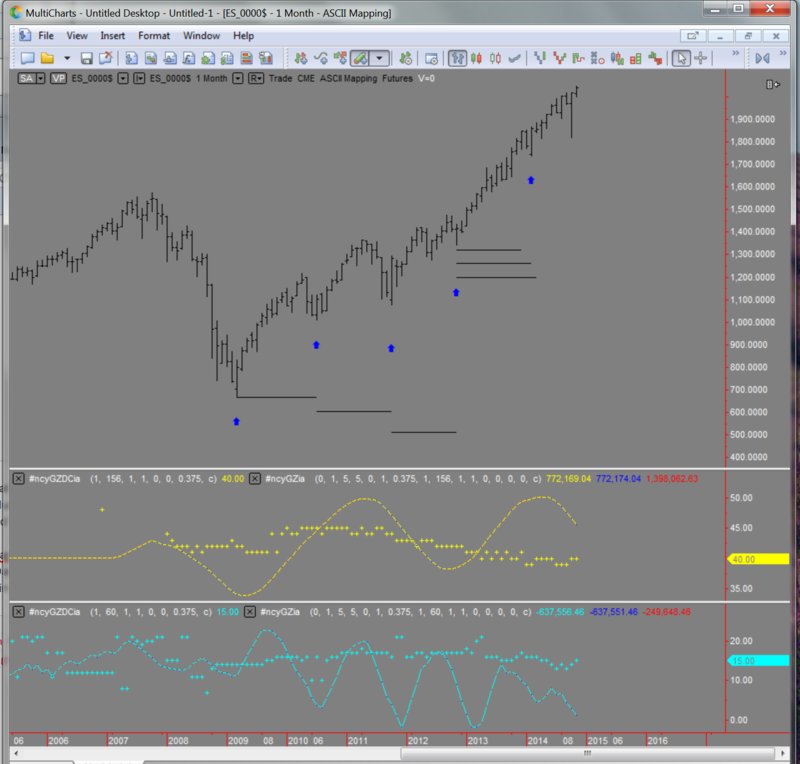 Below is the ST analysis starting at the January 1994 top. Notice that both place the most recent 4.5-yr cycle trough at the October 2011 low, and not in March 2009. 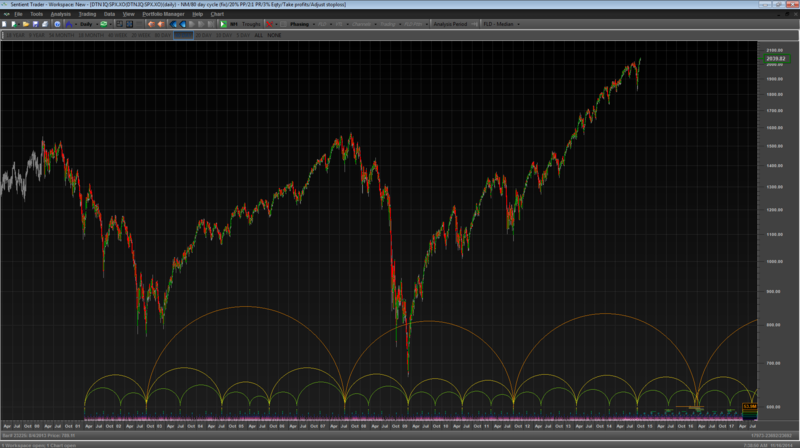 Correct me if I’m wrong, but from the 1994 low to the 2000 high there were no “bearish” 80 week cycles. Also there were no “bearish” 80 week cycles from the 2002 low to the 2007 high. Therefore I submit that the non-“bearish” 80 week cycle from October 2011 low to the November 2012 is neither an “anomaly” or “inconsistent,” at least with respect to the last 20 years of price history. 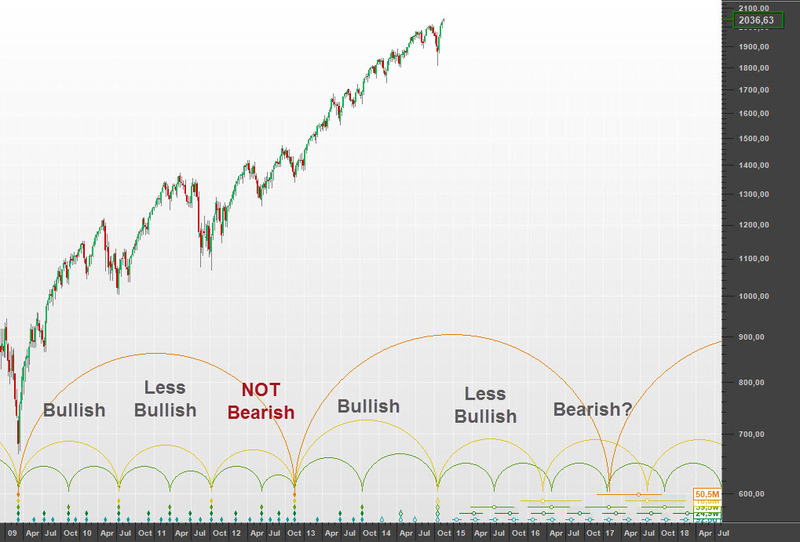 Whether a particular cycle is “bullish” or “bearish” is merely a function of the trend underlying that cycle which cannot be accurately predicted with consistency. Based on the analysis that phases the most recent 80 week low in October, the period of that cycle is 99 weeks. The average period of the prior three cycles of the 80 week is 64.33 weeks, very close to the historical average. The deviation of the presently phased 80 week wave from the average of the prior three oscillations is approximately 54 percent, an excessive amount in my opinion. Thanks William! And as Huub points out the bullish 18-month cycle is probably a part of a much longer mid-channel pause. Allow me to take this opportunity to put forward that there is a significant predictive range when correctly identifying a mid channel pause in the first part of a cycle, possibly (probably) even more than for an “M” shape, as 3 years worth of puzzling and trying everything else to reject those other possibilities gives you around 9 years worth of predictive range at a much higher level. Provided it is correctly done. I can probably provide other ST views for underpinning after I sort out a few things, if this is appreciated. Then for proper credits: in the recent book of Christopher Grafton “Mastering Hurst Cycle Analysis” the relevance of the MCP is very well treated. Mr. Hickson, Sid, at ElliottWavePredictions.com, uses your software along with Elliot Wave and his predictions agree with your work. I am just learning about Hurst Cycles, and I am excited, too, about his discoveries–thank you for creating Sentient Trader software! Thank you Jim. I am always delighted to find others excited about Hurst Cycles. I am also very interested in Sid’s work – the combination of Elliott Wave and Hurst is very powerful. Very interesting Tom. I might need to postpone my bearishness several months! If I am reading your chart for the S&P 500 correctly, you are suggesting that the S&P could go all the way down to the 600 level. Hi Jim. No I think that 600 would be extreme. That would imply a symmetrical 9-year cycle, and it is already showing definite bullish tendencies! The move down to the 9-year trough should be big, but it would be very unlikely to carry price to the 600 level. 9 year cycle bottom should arrive in two stages on 03/2019 and 03/2022, I favor later to be lower bottom. We are in a process of building major 18, 54 month and 9 years market highs. This things take time and require conformation etc. braking major support levels. Generally from now and until the bottom of 18 month cycle, sometime before 03/2016, not much positive is going to happen.